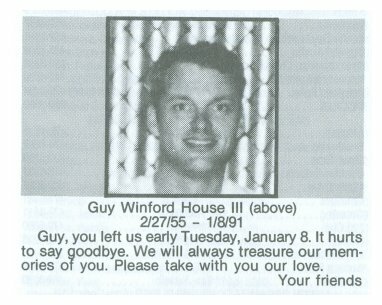 Guy Winford House III lived in Houston and worked at Heaven at the time of his death. He was Michael Brian Lovell's best and oldest friend. Guy and Michael were both originally from small towns in Alabama, and they'd met in Birmingham when they were chicken. I believe they moved to Houston from New Orleans in 1980, prior to New Orleans they'd lived in Atlanta. Both were close friends of mine. We all worked for Charles Armstrong at the time, when today's South Beach was Heaven, and everybody was doing too many drugs. We were like a family, and Mr. Armstrong always stood by and helped his employees even when they were too sick to work anymore. Before he joined the staff at Heaven, Guy House had previously worked for many years as a cashier at the Disco Kroger on Montrose. Michael was my roommate at the time of his death, twenty five years ago. We met through work and he offered me a place to stay. Michael taught me how to mix records, and he left me his record collection and most of his personal effects. I still have all the records, and a few of the effects I didn't pass on to others. I wrote his obituary, which I hadn't seen since I lost the TWT containing it many years ago, until I read about your project in OutSmart. Guy died a year and a half later. At the time, he was my downstairs neighbor at the complex I'd moved to after Michael died. I don't remember who wrote his obituary, but I do remember his pickup truck disappeared the day he died. Thank you for making me remember, not that I ever forget.